Kettering Town will be looking to bounce back when they take on Lowestoft Town at Latimer Park on Saturday. 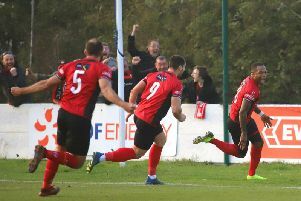 There haven’t been many bad days for the Poppies in the Evo-Stik League South Premier Division Central so far this season but last Saturday was certainly one of them. Marcus Law’s team were well beaten 3-0 by lowly St Ives Town at Latimer Park with all three goals coming in the first half. It came off the back of a 4-4 draw with Redditch United, meaning a Poppies defence that had been so strong up until that point has now conceded seven goals in the last two league matches. More importantly, a five-point lead at the summit has now been wiped out with Kettering still on top but only on goal difference from Stourbridge, although the Poppies do have two games in hand on their nearest rivals. But Law’s focus is solely on trying to make sure his team don’t make the same mistakes of last weekend against a Lowestoft team who are currently hovering just above the relegation zone. “We can’t just ignore what happened,” the Kettering manager said. “As much as we know it was a bad day at the office, the game highlighted a few areas that we really need to look at. “I think it’s shown that teams are more aware of us and prepared for it. “We know some teams will come and shut up shop and while people will say we have a better side than last season, we have to make sure we tweak a few things to be able to deal with those situations. “I have seen clubs win the Champions League by being defensive minded so if it can happen at the top level then it can definitely be effective at this level so we have to be able to deal with it. “It’s never easy and we know teams will give us nothing and when we overload and get people forward to try to break them down, it can always leave you open.